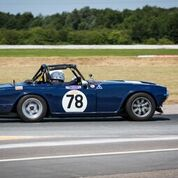 This is a Lotus 7 Club day we are sharing with MGs on Track. We have one of the three 20 minute sessions per hour giving over 2 hours of track time for each car. The morning session will run on the Coastal Circuit, the afternoon on the International Circuit. Anglesey event have 4 TR Register places available. Book here or by calling the office.